Theseus was the King of Athens and a legendary hero. This sword is guaranteed to become just as legendary. Equipped with a massive 30 1/4 in. blade constructed from solid 420 stainless steel and accented with heavy blood groove and laser etch of ancient symbols. The cast metal pommel and guard surround the contoured grip. Stretches 40 1/4 in. overall and includes solid wood wall plaque. I bought this for my son as a graduation present. He loved it! And having his name engraved on it made it even more special for him. I wish i would have received the mounting hardware that mounts the plaque to the wall and, i'm assuming, would mount the sword also. I contacted customer service about this and the girl i talked with was very nice and helpful but there was nothing they could. I highly recommend this item and will definitely be buying more products from BUDK. I bought one 3 years ago from another site, outstanding, I've actually broken 3 other swords with it and have no dents, plus it has beautiful craftsmanship! 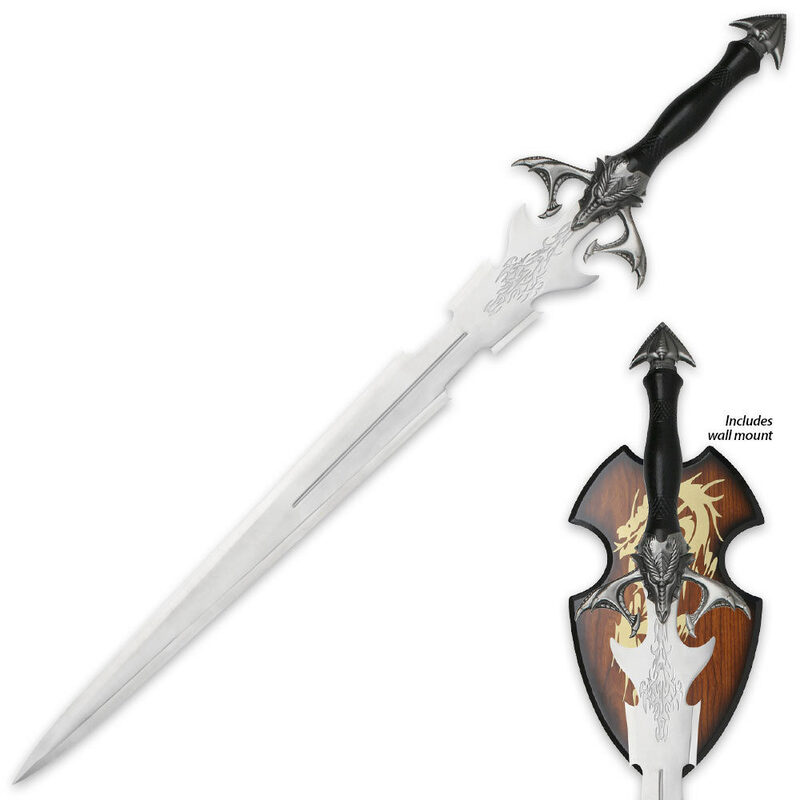 I use this sword for company awards--Great item! very beautiful. Huge. Not as long a i thought though. Very heavy. Handle is short and isnt in balance with the sword. shakes a little. Not sharp,(Its for display). Great details. just got it today. extremely top heavy and not sharp at all and the handle is a little bit shaky.. not much but you can feel it. also its a display sword so you dont really need it to be sharp. other than that its a very nice sword. details are great. and i really like it. so over all id say its a good buy. IT IS AWSOME!! its a lot lightter than expected which is great cuz it lets you swing better. it also has a kool design on the hilt and the blade itself. Gorgeous sword. The blade's dull, but that's to be expected, because it's for display. The plaque isn't fit to the sword, however, which was disappointing.